Floatover equipment from Trelleborg’s engineered products operation has contributed to the successful mating of Statoil’s landmark Aasta Hansteen gas field project’s 24,000-tonne topside and the world’s largest Spar FPSO platform, off the coast of Norway at Stord. Following a 14,500 nautical mile journey from South Korea, the 24,000 ton topside for the Aasta Hansteen platform was towed from Ølensvåg to Stord on the west coast of Norway. 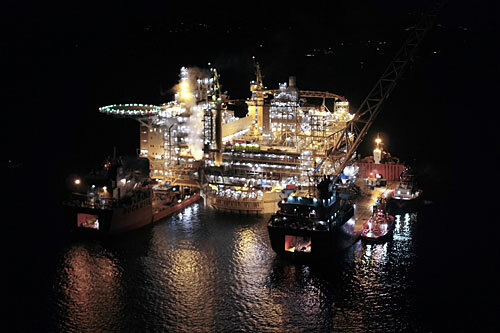 At Stord it was floated over the seabed-mooredvertical cylindrical hull of the 200 metre long, 46,000-tonne Spar FPSO platform. Trelleborg designed, tested and delivered two topside mating units with design loads of 1,500 MT each, as well as eight dual barge floatover support units with support design loads of 7,500 MT. These were essential component of the floatover system, as they acted as support points between two barges that supported the topside as it was slowly moved into position over the substructure.